For organizations who might be feeling this way, here’s an assuring reality: just because you’re running older legacy applications does not mean you’re unable to integrate newer mobile technologies that meet your enterprise’s modern needs. The truth is, the IBM i platform supports older applications as well as the implementation of newer, more modern technologies. And its ability to do so opens the door for organizations who are thinking about integrating many of the mobile capabilities that are so important in today’s manufacturing workplace. In this blog, we’ll touch on what some of those “mobile” capabilities are, why they matter and how you should (and should not) approach their integration. Mobile efficiencies on the floor: For staff members who may be running operations on the plant floor or in a distribution center, there’s an obvious need for the ability to access key data from a smaller, more convenient mobile devices vs being tied to a physical terminal. Remote empowerment for key staff: Field personnel, including your sales force, can be empowered with information that is accessible anywhere. They in turn can use that information to deliver better customer experiences. This also includes your sales forces who need access to data on a mobile device outside of the plant. Additionally, apart from some of the functional capabilities, integrating these types of mobile functionalities can be an important factor in attracting top talent among the millennial workforce; a group that is generally resistant to older technologies. While “adding on” mobile applications can help you extend the life of your ERP, it is important to avoid the creation of a hodge-podge infrastructure with applications haphazardly tacked on top of one another. It is also important to put some thought into the integration of your back-end systems. A little forethought into simplifying that access to data will go a long way in simplifying your move toward having all the right apps at your fingertips. The first step is to identify aspects and operations at your business that can benefit from added mobility and easy access to information. For example, mobile applications can help you deliver superior customer experiences. Let’s say you have a sales representative visiting a customer. A mobile application can tie together related information such as the following: when the order was placed, when it was shipped, tracking details, the status of any offers or discounts the customer might have redeemed, and so on. All of this is at the fingertips for your representative and they can instantly answer what your customer wants to know. This ability to connect disparate data and complete tasks on the go brings speed to your operations, no matter which industry you are in. So identify your specific use case and work on integrating a mobile application that can plug in to fulfill it. Once you know the solution you want, the next step is to identify the resources you have in-house to help implement it. Evaluate your current ERP capabilities and personnel expertise. IT departments may not have in-house resources or expertise available to develop and integrate certain aspects of the mobile applications. But those RPG skills that most IBM i shops have can be put to good use in writing web services to support your new mobile initiatives. Also evaluate which software tools may be available to help you along. Adopting third-party software tools can be a good way to augment your resources and achieve a successful integration. These tools reduce the risk, and also force you to adopt certain standardized practices which work out well when it comes to creating interoperable solutions. 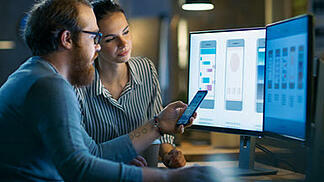 The bottom line is this: having a legacy ERP or running older applications on your IBM i platform does not mean that you cannot take advantage of modern mobile applications. You can extend the life of your existing platform by integrating mobile applications that bring in new functionalities. All you need to do is identify the right use cases, find the right mix of skills, start building (and benefitting from) these solutions – and delight in the fact that your legacy system never looked so good.